While the result of piercing your ears is glamorous, actually piercing your ears can be tricky and a bit risky. However, if you are like the twins in the Parent Trap, and you really want to pierce your ears (either because you need to impersonate your twin, or because you just like how it looks) follow these steps to bedazzle your ears in a safe way. Ask your parents if you are a minor. Use pre-packaged 70% isopropyl alcohol swabs to clean your ear. You must do this so that your ear is completely wiped clean of any bacteria that may have gotten into your piercing. Wait until the ear is dry to pierce it. You can also use hydrogen peroxide or rubbing alcohol to sterilize your ear. Make a mark where you want your piercing(s) to go. It is important to plan ahead for where you would like the piercing to go; otherwise your piercing might end up crooked, too high, or too low. If you are piercing both of your ears, look in the mirror and make sure that the marks you have made on your ears are even. If you have other piercings and are doing your second or third piercing, make sure that you leave enough space in between piercings so that you can wear studs in both holes without the earrings overlapping. Likewise, don’t make your holes too far apart or they may look odd. Get a sterile piercing needle. Piercing needles have a hollow center so you can easily slip your earring through your ear once you make a hole with the needle. Do not share needles with other people as this could lead to infection. Piercing needles can be cheaply obtained at many online vendors, as well at many piercing studios. 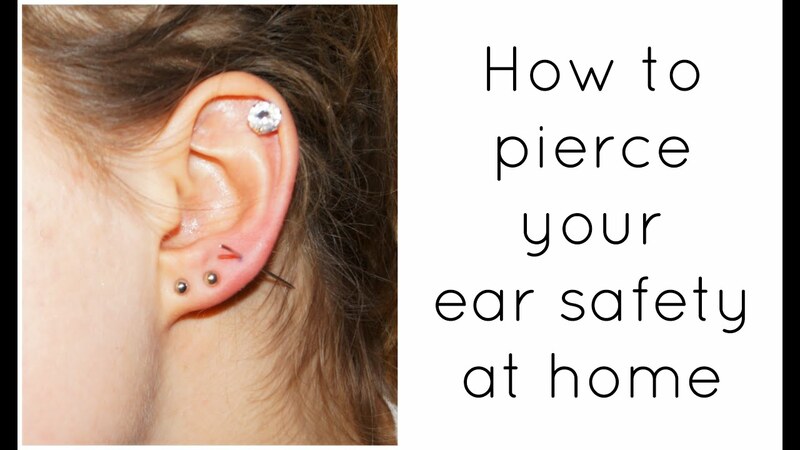 Make sure to use a needle that is one gauge bigger than the earring that you plan to wear. 16 gauge barbell studs combined with 15 gauge needles work well. You can also choose to buy a piercing package, which comes with two sterilized piercing earrings that have been loaded into a spring puncher. You can purchase these at beauty supply stores. Make sure to follow the directions on the package exactly as they are written. Pick out your piercing earrings. The best thing for newly pierced ears, whether it's through lobes or cartilage, are studs. 16 gauge and about 10mm long (3/8") is a good size; the length allows for swelling, which can easily double the thickness of your ear. Some jewelry stores sell piercing earrings--these are earrings with a very sharp tip similar to a needle. These are good to use because they will re-pierce your ear as you slide it into the hole made by your needle. If you can, purchase earrings of a higher quality metal such as silver or titanium. Metals of higher quality are less likely to infect your ear or cause an allergic reaction. Be aware that some people are allergic to lower quality metals like gold-plated metal. Sterilize the needle with an open flame. Do not reuse someone else's needles; your needle should come in a sterile package. Hold it there until the tip becomes red hot. You should wear sterile latex gloves while doing this so as to make sure that any bacteria on your hands does not get on the needle. Be sure to remove any soot or detritus. Wipe the needle clean with 10%+ rubbing alcohol or hydrogen peroxide. Be forewarned, this will only be a partial sterilization and will not kill all the potential microbes that may be on the needle. The only way to completely sterilize piercing utensils is by using an autoclave. You could also sterilize the needle by boiling water. Once the water is boiling, place the needle in the boiling water and let it stay there for 5 to 10 minutes. 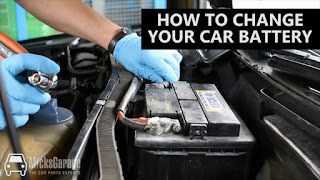 Remove it with tongs and only hold it with sterile latex gloves. Wipe the needle down with hydrogen peroxide or rubbing alcohol. Wash your hands with soap and water. This will decrease any chance of bacteria of spreading. Put on sterile latex gloves after you have washed your hands. Keep your hair away from the spot you are planning to pierce. Your hair might get stuck in between your ear and the earring, or it could get pushed through the hole you make with the needle. If possible, tie your hair up and away from your ear. Find something sturdy to put against your ear. You need to have something against your ear so that you can push the needle through your ear without accidentally piercing your neck too. A cold, clean bar of soap or a cork are both good choices. Avoid apples or potatoes, even though that’s generally what’s used in the movies. Apples, potatoes, or any other food may have bacteria on it that could infect your piercing. If possible, have a friend (or friends) help you with the piercing. Either have them hold the cork against the back of your ear or, if you trust them immensely, have them do the actual piercing. This whole process is much easier to do when you have someone there to help you. Place the needle in the proper position. The needle should be perpendicular to your earlobe. This means that it should make a roughly 90-degree angle with the mark that you made on your ear. Positioning the needle this way will allow it to slide more effectively through your ear. Take a deep breath and stick the piercing needle smoothly through your ear.Make sure it goes through the spot you have marked. You may hear a popping noise when the needle goes through--don’t freak out! Wiggle the needle, then keep it bent at an angle. If you are using a hollow piercing needle, thread the jewelry through the center of the needle. Put the earring in your ear. 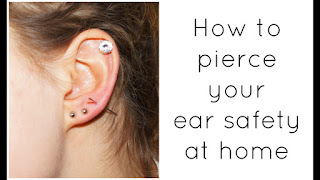 After you've pierced your ear, and while the needle is sticking through the ear, place the shaft of the earring into the hollow tube of the needle and then push it all the way through the ear. This will leave the earring sitting comfortably in the new hole. Remove the piercing tool. Slowly remove the needle from your ear, making sure that the earring stays in place. Be aware that this will most likely be painful, but try not to rush it, as you don’t want the earring to fall out or else you will have to go through the piercing process again. Be aware that the hole you have made could close up in minutes if left without an earring in it. If your earring falls out, resterilize it as quickly as possible and try to fit it back through the hole. If it does not go through, you may have to pierce your ear again. Leave the earring in for six weeks. You should not take your earring out at any point. After the six weeks have passed, you can switch the earring out, but replace it with another earring immediately. It often takes six months to a whole year for the hole to fully take shape and not close up when you leave it without an earring for any duration of time. Wash the piercing daily. Wash your ear with a warm salt water solution. Use sea salt or Epsom salt rather than normal table salt. The salt cleans out the piercing and keeps the hole from getting infected. Clean the piercing until it is fully healed (up to approximately six weeks). Don't use rubbing alcohol once the ear is pierced. An easy way to clean your ear is to find a small cup about the same size as your ear and put the salt water solution into that. Put a towel under the cup (to catch any overflow) and then lay on the couch and lower you ear slowly into the warm, salty water. 5 minutes of that and your ear will be feeling as good as new! "1 cup/250ml" measuring cups work well for this. You can also dip a cotton swab in the warm salt water solution and rub it around and against the piercing. There are also antiseptic solutions specifically made for newly pierced ears. You can buy them at beauty supply stores. Again, dip a cotton swab in the solution and then rub it in and around the piercing once a day. Rotate your earring when you clean it. Hold onto the stud part of the earring (the part in the front of your ear) and twist it so that it rotates in the hole. This will open up the hole you have made in your ear and will keep the hole from closing too tightly around the earring. Remove your piercing earrings and put new earrings in. Do this only after six weeks have passed. Put the new earrings immediately after taking the original earring out and cleaning the hole. It is best if your earrings are made of 100% surgical steel, titanium, or niobium, as these materials are not as prone to causing infection as cheaper materials.